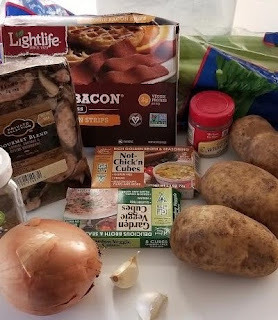 My Mom definitely gave me a challenge this week as I was to recreate a vegan-version of New England Clam Chowder. Originally from a cooler climate, I am a chowder-fanatic. I do admittedly miss a decent chowder every once in a while, and I have yet to actually attempt to make one. I suppose there is a first time for everything! Before I started on the soup, I decided to make the two most 'vegan' components of this chowder-- the cream base and the 'clams'. I found a good recipe from Fork and Beans that outlines exactly how to do everything from start to finish. They do everything a little bit different, and they use a different soup base. 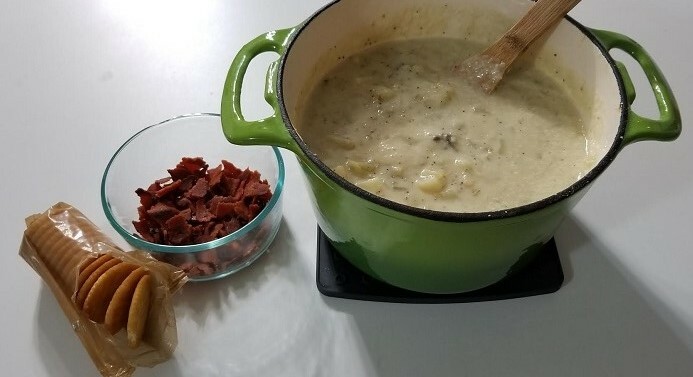 My goal for this chowder was to keep it as close to my Mom's original recipe as possible, so I just used the components that I needed to. 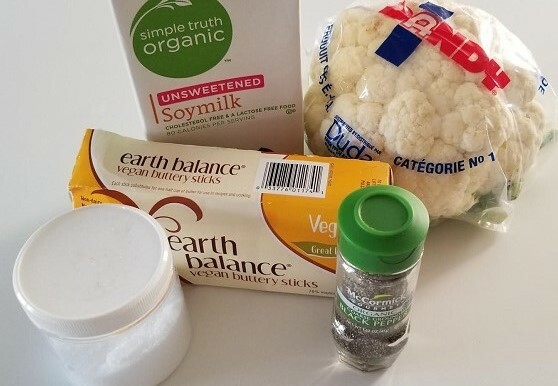 For the cream base, I grabbed the ingredients: cauliflower, soy milk, butter, sea salt, and pepper. I steamed the cauliflower, and mixed everything together and blended it with my immersion blender. It formed a semi-thick sauce, much like a half & half would be ... and it tasted delightful. I am going to use this base for many more meals! Next, I made the 'clams'. 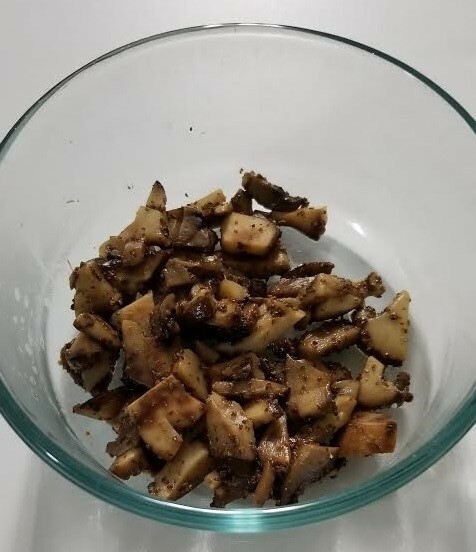 I gathered my ingredients: shiitake mushrooms, white wine, butter, and celery seed. 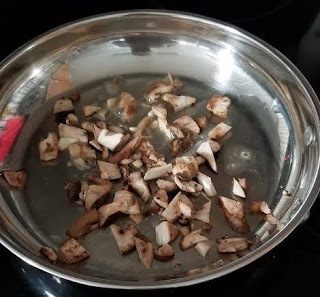 I melted the butter and sauteed the mushrooms. I added the white wine until the mushrooms absorbed all of it and poofed up. 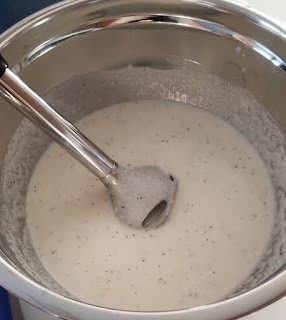 When all of the wine absorbed, I added the celery seed. Now that the 'components' are complete, it is time to start the soup. 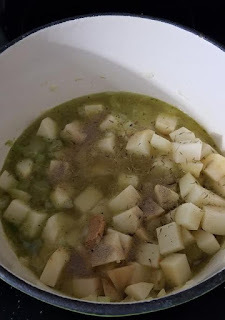 I grabbed all of my ingredients: veggie bacon strips, celery, an onion, garlic, potatoes, vegetable broth cubes, non-chick'n cubes, white pepper, and dried thyme. First, I got out my Dutch oven. 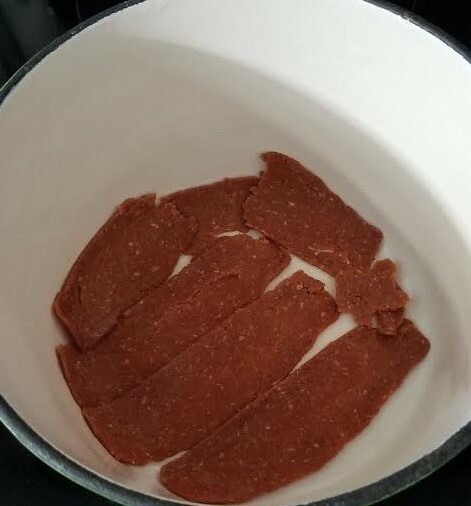 I crisped up a few more than the recommended (4) bacon strips because the veggie bacon is smaller in size than normal bacon. I also added a little olive oil for more 'grease'. 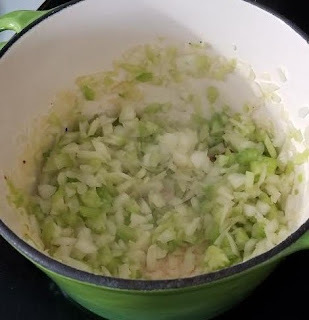 I chopped up the celery, onion, and garlic as per the instructions and sauteed them in the Dutch oven until tender. Next, I stirred in the cubed potatoes, the water, the vegetable broth, the non-chick'n cube, pepper, and thyme, brought it to a boil, and simmered (uncovered) for 20 minutes. I also added about 5 pieces of shredded veggie bacon for a little added flavor. I totally omitted step number 2 because my cream base was completely smooth to start with. Finally, I stirred in my 'clams', and served in my Dutch oven alongside the crumbled bacon and crackers. EDIT: I must say, this soup was divine. As I mentioned above, I haven't had a chowder in oh-so-long, so being able to indulge without the guilt was priceless. The flavors were all there, the textures were on point, and everybody enjoyed it. I couldn't ask for better results. All of us readers would like to know how it turned out! Did you love it or was it meh? @Anon ... Oh, I am sorry! I added a small edit to the bottom of the post. I should have definitely let you know that it was delicious. I could have probably eaten the entire pot. I'm sure my husband would have been majorly disappointed if there weren't any left for him! Ha! 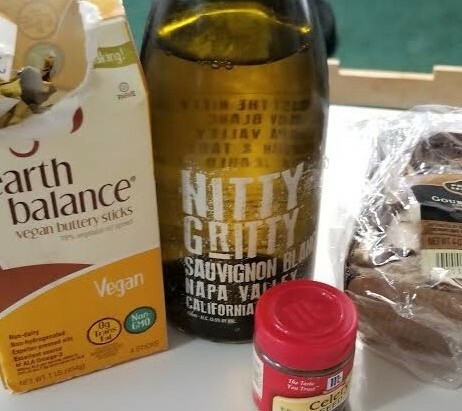 What a great job with your vegan conversion! The chowder looks sooo delicious! Let's see what recipe we can do this week! Although it's Thanksgiving week, so I'm not sure how much I will be cooking on the other days. Great job, Melissa! Wish I could have tasted it. @Darlene ... Mom, couldn't have done it without you! Ha! Seriously, you will love the base chowder recipe. Try it.